As promised, my monthly update. And, with a shock, I realise it’s now six months since I started this project. Am I any closer to seeing it realised? Yep, ish. I have now received all but one questionnaire back, and the tardy person knows who he is. I forgive him for I know that he’s busy. And since the outstanding feedback is for Part Five, I can proceed, for now, without it. I’m pleased to report the feedback was … encouraging. There are glitches that need attention (which is next on the agenda). Most of the readers highlighted the same areas so I know it’s not a matter of personal taste. As to the critique … I have to say Joy was exceedingly thorough. Which I did appreciate, even if at times I screamed at the imaginary form of her sitting beside me and tore out my hair. Most, but not all, of the issues she raised I shall be addressing in the coming weeks. I count every jot of feedback as invaluable and wish to thank all those who participated. I hope the exercise has whetted your appetite and you’re keen to perform the same services for Book Two, Asaric Axis. For this, I set my target at 100 hours of revision on Asaric Axis (Book 2). Since I was waiting for feedback on Asaric Lies, I reckoned this commitment would keep me sufficiently distracted and patient. I had already started work on this second book: what I call a ‘read through’. There’s no such baby, though. I’m compelled to make changes wherever/whenever encountered, even if only to change that wicked imperfect to perfect or passive to active, or to delete repetitions and correct omissions. The main purpose of the read through was to familiarise myself with the story—it being five years since last I read it (while uploading to blog). At the same time, I needed to check out all things structural. There was no problem with where the ‘episode’ fits within the overall story. Everything breaks where it should. But what about the plot for this episode? Oops. Long time ago—like, before I uploaded it back in the Dark Ages; in fact, longer ago than that (the file, when finally found, was dated to 2009)—I deleted a scene. I had thought it not needed, that I could fed-in the relevant information. Oops and double oops! Turns out, that scene was central to the inner plot of Book 2. So, out it came, dusted off and reinserted. 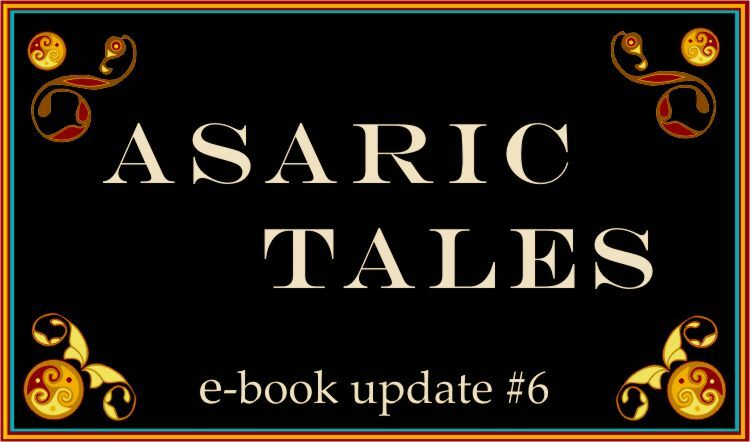 The other structural fix was to take what had been the final two chapters of Asaric Lies (as in an epilogue and hook to Book 2) and convert them to a Prologue for Asaric Axis. Structural fixes fixed, I ramped on with the rewrite. Here my attention was primarily on scene-headers (I admit to my habit of not including the where and when of scenes.) I also moved chapter breaks to improve the tension and provide a more satisfying read. Which then required a rewrite of the next scene header. And so forth. And that, basically, is where I’m at. When the month began I had just started what now is Chapter 7. 19k words into the story. I continued, hit the end, scanned through for scene analysis; moved, found, inserted, edited, and began the rewrite-proper. When the hundreth hour struck I found myself at Chapter 14. That’s a total of 73k + 16k = 89k words, total. Was it easy to complete the 100 hours on time? It did require me to shelf other projects, especially towards the end when I feared I’d been too optimistic. But, one final push on Friday, and I completed. Yesterday I spent processing photos. Yippee! I am a solitary writer and always have been. I’m self-motivated. I’m perhaps one of the lucky few who don’t struggle to find inspiration. It hits me, often when my hands are deep in sudsy water. But it was good to have other writers to ‘chat’ with. We struck up a discussion on the use of notebooks v. computers in the planning stages. We commiserated, we encouraged, we supported. I think I have made a few friends. And for a solitary writer, that’s not to be sneezed at. Next is to address the problems highlighted by my beta-readers and the critique. Though I have already done this in outline, I need now to apply my ideas and hope they work out. Then? I submit it to Critters.org with its (new) Prologue (the inclusion of another deleted chapter that I first had to find). I can anticipate the Prologue at least will be critiqued. Hopefully, it will tempt someone into a full novel critique. And that’s May sorted. Once I’ve packed that away, it’s back on with the rewrite of Asaric Axis (which might change its name). And then I’ll be asking for beta-readers. Again. 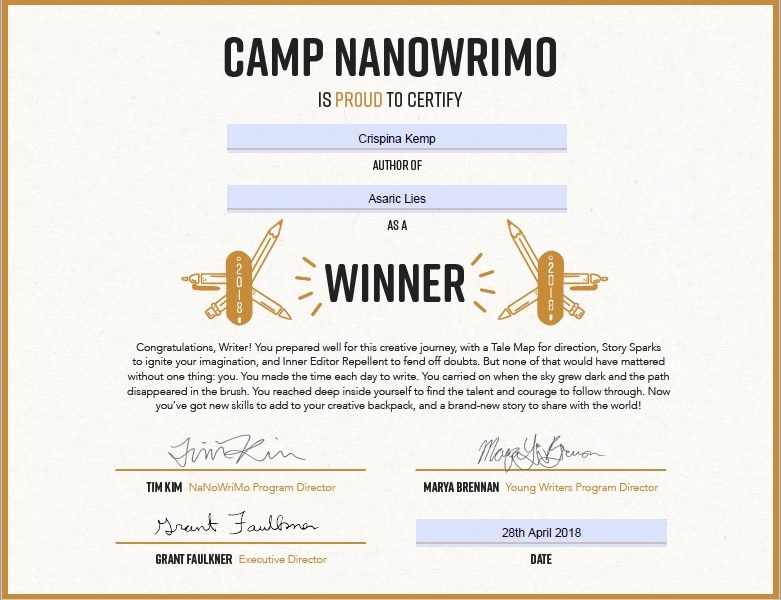 This entry was posted in On Writing and tagged Asaric Axis, Asaric Lies, Asaric Tales, Beta Readers, Camp NaNoWriMo, e-book. Bookmark the permalink. It was a new experience for me. As I said, I’m very much a solitary writer, and so obsessed I don’t usually lack for discipline. Prying me away from the writing is usually the challenge! But it was great to ‘meet’ you guys and to discover your blogs. It was great to have you in our cabin at Camp NaNo, I’m so glad you joined us! And I’m glad it was supportive for you. It always is for me! I’m also glad you appreciated my critique. Thorough, infuriating, but mostly helpful — that’s basically what I’m aiming at, lol. You’ve made great progress on your revisions already but I know you have a lot left to go, so keep up the great work! A long way to go. But I enjoy it more than I would have enjoyed the walk around coast of Gt Britain. Well, on the blog you tended to set up chapters by offering a bridging interlude from the previous chapter to the new one. I’m not sure if that’s one of the reasons place and time sometimes didn’t make it into the chapters; you are a better judge of that than I.
I sympathize. My earlier stories tended to have longer chapters because I was thinking more in terms of books. Still, converting ANY of them to books means rethinking all the chapter endings! So you can appreciate that in this rewrite/revision period, this is occupying the most time. Add to that, that I’m prepping a previously posted story from way back, which might, as yet, end up as an e-book, and you can guess that my fingers are mostly productively occupied. That is, when they’re not clicking the camera! Oh, for a lazy while-a-day.